The First Person To Be Honored With A Hollywood Walk Of Fame Star For Live Performances Was? The Original "007" Was A Real Spy By The Name Of? Established in 1958, the Hollywood Walk of Fame, a 1.3 mile stretch along Hollywood Boulevard and short segments of Marshfield Way and Vine Street, originally honored people in the motion picture, broadcast television, audio recording or music, and broadcast radio fields. In 1984, an additional category was added, represented on the sidewalk by comedy/tragedy masks, for theater and live performance. The timing of the arrival of the new category was perfect for honoring Mickey Rooney as the first person to be enshrined on the walk under the comedy/tragedy theater masks. Rooney was already a titan of pop culture in his own right with an enormous career spanning most of the 20th century. He appeared in over 300 films, had been a comedian, a radio personality, and during the late 1930s, was one of the best-paid actors in Hollywood. After World War II, however, Rooney struggled with both personal and professional difficulties swinging between long stretches of simple guest appearances and then sudden brilliance in roles like his portrayal of a jockey in 1979’s The Black Stallion. 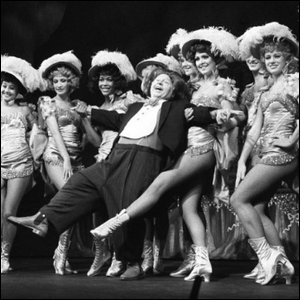 In 1979, Rooney returned to his earliest roots as a stage actor when he appeared on Broadway for the first time in the critically acclaimed Sugar Babies. He went on to perform the play 1,208 times in New York and this shining moment, a comeback extraordinaire, earned Rooney the first live performance star on the Walk of Fame. Image courtesy of Broadway World.